Product #18715 | SKU LP36446 | 0.0 (no ratings yet) Thanks for your rating! The black S&F Lens Exchange Case 100 AW from Lowepro is designed to carry one wide angle lens such as a 14-24mm f/2.8 or a 16-35mm f/2.8. The case is designed for rapid lens exchange so you can take out your lens with one hand, replace it on your camera, and store the removed lens. This increases ease of operation and lens exchange speed. The interior of the case has a dual compartment design that holds two lenses while the case is open but will not close with both lenses inside. The handle is attached to two zippers that slide open for instant access to the contents. The case collapses back to a single-lens shape once a lens is removed. There are two mesh side accessory pockets that are sized for a lens cap, body cap or filter. The case comes with a built-in All-Weather AW Cover that protects the case when the weather turns against you. The 100AW case has an easy and fast access wide opening. Once unzipped, the case folds open but is designed to prevent the lens from sliding out with its two side panels. 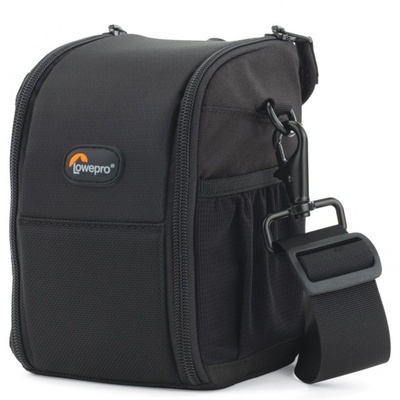 The case uses a SlipLock attachment tab that allows the pouch to be worn on an optional, compatible S&F belt or other Lowepro SlipLock product. It is carried by an Easy-Grip handle that contains two zippers or its removable, adjustable shoulder strap. The S&F Lens Exchange Case 100 AW case comes with a limited lifetime warranty from Lowepro.